There is a bit of literature published on group work. In general, the research says that group work can increase motivation, develop individual responsibility, and allows students to co-construct knowledge as a result of member interactions that produce new viewpoints. There are some setbacks, however. Students, for example, must be provided models of effective communication because they may not have the prerequisite skills needed to interact with group members. Vik (2001) says, “few instructors do much more than assign [students] the teams, and effective teamwork requires training in how to work in teams” (p. 112). Due to some of the bad groupwork experiences some students have had, the term “group-hate” was coined to indicate the negative attitudes students have to group work (Sorensen, 1981). Oftentimes, these experience stem from a loss of individual control, the need to tutor less competent group members, and low self-efficacy. Also, some students dislike the prospect of being evaluated as a group or by a group that has these negative behaviors because their desire for the highest individual grade can be at odds with effective cooperative learning. Assigning students to teams on the first day sets a precedent for the group work experience and for real-world work environments. The optimal size if 3-4 people. Faculty can take different approaches to creating teams: different abilities and GPAs or different concentrations. Students may be given a questionnaire to help the faculty best assign student to teams or to help students get to know one another. On the first day, faculty can also define rules and procedures for teamwork and have students develop a team contract. There should also be a discussion about “hitchhikers” and “couch potatoes” who may not contribute to groups. About 1/3 and 2/3 of the way through the class, teams should have an opportunity to identify team problems with their instructor and to peer review their team members. One option at this point is to allow students to disband if their group is not working. Some students will not have had group work or peer review experience and will need to be coached through the process. Providing tips and guidance will help students to take their role in the group seriously and to solve problems together. Another option is to discuss research on group work at the very beginning of the experience. 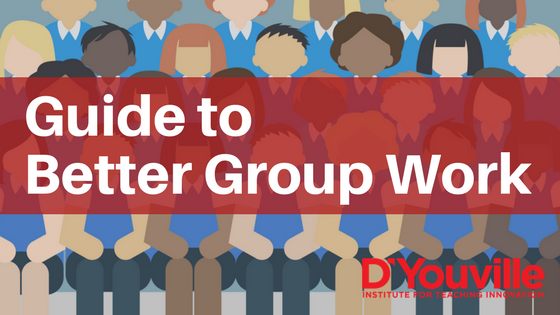 Through this discussion, students better understand group work scenarios and will develop the language needed to communicate with their peers about the ways groups should work together. Creating opportunities for students to assess their team members and their “team citizenship” will provide the instructor with some knowledge about how well the groups are working and who in the group may need some development. If the general thoughts are shared with students, it may help them to improve their contributions. Choi, W., Zeff, L. E., & Higby, M. A. (2018). DESIGNING A GROUP ASSIGNMENT IN A DIGITAL ERA. QRBD, 21. King, P. E., & Behnke, R. R. (2005). Problems associated with evaluating student performance in groups. College Teaching, 53(2), 57-61. Sorensen, S. M. (1981). Group-Hate: A Negative Reaction to Group Work. Vik, G. N. (2001). Doing more to teach teamwork than telling students to sink or swim. Business Communication Quarterly, 64(4), 112-119.